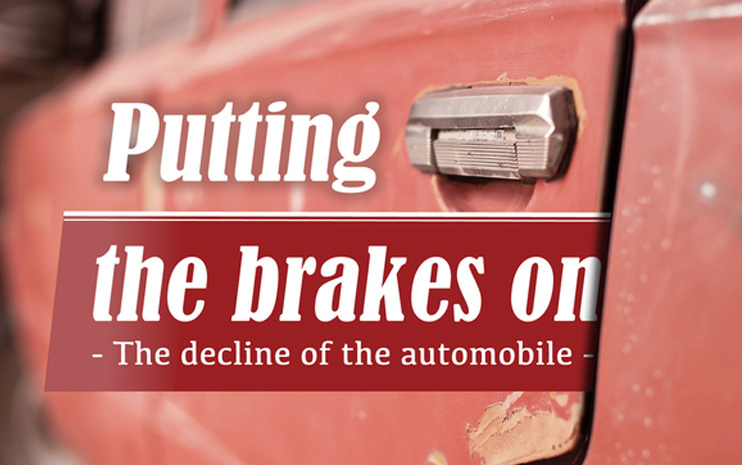 The decline of the automobile. Getting your driver’s licence was once a rite of passage for Australians. Millions of baby boomers and Gen Xers can still call to mind every detail of their first car and the adventures, romantic and otherwise, they had in it. But the times they are a’changing. For the first time, young people are less likely to get a licence than their parents.i In Victoria, licencing rates for people under 25 have dropped from 77 per cent to 66 per cent between 2001 and 2013i. Even if they do pass the driving test, a growing number of Gen Ys are shunning car ownership – in NSW only 51 per cent of young people have a cari – while if they do own a car, they drive it lessii. All over the developed world young adults have become increasingly less likely to get a driver’s licence. In America, the spiritual home of the automobile, an estimated 26 per cent of Gen Y go without wheelsiii and declines have also been recorded in Canada, the UK, Japan and much of Europeiv. So why are the youth of today so down on driving? There are several theories offered. Some researchers argue the decline is a laudable effect of a more stringent approach to road safety. The days of being handed a full license after driving around the block with the local policeman are long gone. And when teenagers have to log 120 hours of supervised driving before they can even sit the test to get their provisional license, it’s not surprisingly many can’t be bothered. Others blame Gen Y’s kidult ways for their lack of interest in what was once a symbol of maturity. Compared to previous generations, young Australians are now more likely to participate in higher education and delay full-time employment, marriage and parenthood beyond age 25. That means they’re less likely to need, or be able to afford, a car. Finally, the digital world in which Gen Y has grown up in is radically different to that of their predecessors. There’s much less need to travel from A to B to catch up face-to-face when you can Skype, FaceTime, text, email, Snapchat or Facebook your peers. In that environment it’s hardly surprising Gen Y digital natives prefer to spend their money on the latest smartphone rather than a car. Interestingly, the research suggests that environmental concerns aren’t shaping the travel choices of young Australians, nor is Gen Y shunning cars because of obesity-related health concerns. While car-loving older generations often looked on public transport and bicycling as inferior transportation options, Gen Y don’t share their sniffiness. Public transport patronage has grown sharply in many of Australia’s capital cities, especially among the young. Cycling, too, is increasingly popular among Gen Ys and share-bike schemes mean cyclists don’t even need to own their own bike to get around. Plenty of young people still get around by car, it’s just that they don’t own – or necessarily even drive – the car in question. Ride-sharing apps such as Uber, goCatch, Backseat.me, ingogo and Lyft continue to grow in popularity, especially among Gen Y early adopters. For those who do have a license, car-sharing services such as GoGet provide access to vehicles at a fraction of the cost of actually owning one. And in a world where everyone has a mobile in their pocket, contacting a parent, friend or work colleague to arrange a lift is as simple as tapping on a few buttons. It appears we’re in the early stages of a transportation revolution. In fact, future generations may find it incomprehensible that large numbers of people once devoted a significant percentage of their income to maintaining a vehicle which sat idle much of the time. Previous Post Is your money personality set in stone?